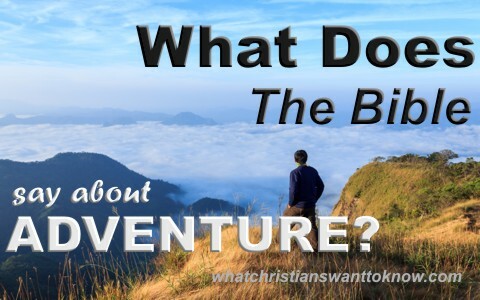 What Does The Bible Say About Adventure? Does the Bible say much about adventure? If so, is it positive or negative? Most of us probably have enough drama in our lives to make a great TV reality show but can you even imagine seeing and experiencing what Moses did? Talk about an adventure and one that’s better than any spine-tingling movie in 3-D. Just to get a glimpse of the glory of God and all those miracles would be too much to behold. What about Abraham who met two angels of the Lord and left all that he had ever known completely behind going to a place he’d never seen before and called by a God he’d never known. Adventure is interwoven throughout the Bible and there are a lot of good things that come from it and a lot of bad things. If God is going with you, then your adventures will be more good than bad, even if bad things happen along the way. Those who walk with God are pleasing God and not going ahead of His sovereign plan for their life and not lagging behind His will for their life. Adventure can be good or it can be very bad. The vital component is whether God is with you and Christ is in you as you go through life, which is an adventure enough in itself. When Israel had crossed over into the Promised Land, they had formidable enemies that still had to be removed. Archaeologists and historians record that these pagan nations were living in idolatry and much of their religious practices during worship included sexual immorality like orgies. Some of these pagan religions had actually resorted to offering their own children in the fire to false gods that didn’t exist. We know that Satan is behind every false religion in the world and certainly in many of the nations surrounding the Promised Land, so it was God’s judgement on these pagan peoples to have Joshua and the Israelites exterminate them. This is where the real adventure begins for the young nation of Israel. Just like any good commander would do, “Joshua the son of Nun sent two men secretly from Shittim as spies, saying, ‘Go, view the land, especially Jericho.’ And they went and came into the house of a prostitute whose name was Rahab and lodged there” (Joshua 2:1). The idea was to send a reconnaissance mission into the city of Jericho to assess the enemy’s strength. That must have been quite an adventure for the spies because they put their lives at risk. Somehow they were discovered and so someone told the “king of Jericho, “Behold, men of Israel have come here tonight to search out the land” (Joshua 2:2) so “the king of Jericho sent to Rahab, saying, ‘Bring out the men who have come to you, who entered your house, for they have come to search out all the land’” (Joshua 2:3) however, Rahab had “taken the two men and hidden them. And she said, ‘True, the men came to me, but I did not know where they were from. And when the gate was about to be closed at dark, the men went out. I do not know where the men went. Pursue them quickly, for you will overtake them’” (Joshua 2:4-5). Finally, when she had tricked the king and his forces to go and pursue them at which time “she let them down by a rope through the window, for her house was built into the city wall, so that she lived in the wall” (Joshua 2:15). Rahab and her family would later be spared by the victorious Israelite army and she would become part of the royal lineage of Jesus Christ. That’s better than Cinderella ever had it! If anyone had bad odds of winning, it was Gideon’s army. The key to his army was God was on His side. When God first approached Gideon, He saw what would be, not what was at the moment. In other words, since God knows the end from the beginning, even before it begins, He knew that Gideon would help Israel rid themselves of the invasions by the Midianites. Every time a harvest was ripe, the Midianites would come sweeping in and take all of it all with them. The result was that “Israel was brought very low because of Midian. And the people of Israel cried out for help to the Lord” (Judges 6:6) but that’s just what God wanted. At the right time, “the angel of the Lord appeared to him and said to him, “The Lord is with you, O mighty man of valor” (Judges 6:12) but Gideon replied, “if the Lord is with us, why then has all this happened to us? And where are all his wonderful deeds that our fathers recounted to us, saying, ‘Did not the Lord bring us up from Egypt?’ But now the Lord has forsaken us and given us into the hand of Midian” (Judges 6:13). What seemed impossible to Gideon ended up as the adventure of a lifetime as Judges 8:10 records that there were at least 135,000 enemy troops against Gideon’s 300 soldiers and yet the Midianites were totally crushed. Never underestimate what God can do through those who the world has little regard for. God often uses the weak of the world to confound the mighty (1 Cor 1:27). This ensures that God receives all the glory. Is there an adventure awaiting you? Here’s a great barometer to judge whether taking a particular adventure is what God’s will is for you. Ask yourself; will it bring glory to God; is it biblical; is it taught in Scripture; is it legal; and will anyone get hurt? If you cannot answer to these diagnostic questions properly, then pray about it, seek godly counsel, read the Bible, and then determine if it’s really best to take this adventure. Thank you for sharing this with us pastor Jack. I was recently reading in Jude 1:5 ESV about the common link between the story of Moses, and the story of Jesus. Both are amazing adventures! Previous post: Should A Christian File Bankruptcy?